Your runs just got a whole lot more mobile. RunGo brings stats tracking and voice navigation to the Apple Watch, so you can run and explore new routes straight from your wrist. RunGo for Apple Watch Series 2* allows you to track and navigate your runs without the need to bring your iPhone. 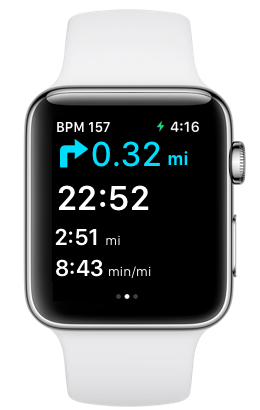 Updated in real time, you can view and record your time, pace, distance & heart rate as you run. Explore custom routes with clear voice directions and haptic notifications. The VoiceOver feature on the Apple Watch uses the speaker to navigate you during your runs. Thanks to the Taptic Engine built into the Apple Watch, you will feel a gentle tap when it’s time to turn left or right. In watchOS 4 we integrated ‘Water Lock’ to avoid tapping the screen and accidentally pausing or stopping your workout. To unlock and use the controls, users have to turn the Digital Crown. We also integrated the watchOS 4 solution which by pressing the Digital Crown and the Side Button at the same time will allow you to pause/resume your workout, even when the screen is locked. Read our press release on the Apple Watch 2 Edition here.